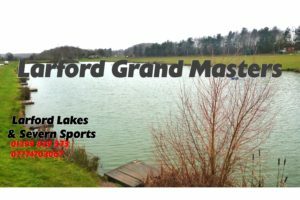 Grand Maters match fished on Specimen & Match Lakes. Winner on the day with a massive 234-03-00 was Chris Senter (Shakespeare) who drew peg 12 on the Specimen Lake burr. Chris caught most of his fish on pole shallow with meat & pellet plus a few late fish down his edge. 3rd on the day was Mark Skidmore who drew peg 79 on the chalet bank of the specimen Lake, weighing 134-04-00 to pole & meat shallow. 4th on the day was Max G (PR Floats) who drew peg 76, fishing shallow on the waggler and pole at 6m. Later Max switched to his edge to finish the day with 126-13-00. 6th overall was Harry Harris (Larford) weighing 123-06-00 from peg 8 on the Specimen Lake. Harry fished shallow with meat on the pole long.